The Finance Bill 2018 has further proposed significant changes in these taxation provisions relating to long term capital gain on transfer of equity shares in a company or a unit of an equity oriented fund or a unit of business trust. A capital gain rising from the sale of a capital asset is charged to income tax under the head 'Capital gains'. A capital asset, being an equity share in a company or unit of an equity oriented fund, are treated to be long term capital asset if these are held for a period of more than 12 months. With the advent of Security Transaction Tax with effect from 1st October, 2004, the long term gains arising on sale of such shares were provided to be exempt from taxation under Section 10(38) of the Act. The intention of the legislature was to avoid double taxation on such transactions as only those shares on which Securities Transaction Tax was applicable were brought in the ambit of exemption u/s 10(38). It has been a general sentiment that this beneficial provision was one of the reasons for diversion of funds in capital market rather than the other productive sectors such as manufacturing sector. Further, in the recent past, there have been instances of abusive use of this exemption provision in the form of escalated incomes artificially created by some assesses, popularly known as penny stock. In order to curb these kind of practices an amendment was brought by the Finance Act 2017 with effect from 1st April, 2018 by insertion of a proviso to Section 10(38) which provides for excluding those transactions in which these shares etc. were acquired on or after 1st October, 2004 on which no Security Transaction Tax was paid. As earlier there was no restriction of the securities being acquired after paying STT. Therefore, the intention of the legislature at that time was also very clear to restrict this exemption to bonafide transactions only. The Finance Bill 2018 has further proposed significant changes in these taxation provisions relating to long term capital gain on transfer of equity shares in a company or a unit of an equity oriented fund or a unit of business trust. By this proposed amendment, long term capital gain arising on such transactions exceeding Rs 1,00,000 will now be taxed at a flat rate of 10%. For this, a new Section 112A has been proposed to be inserted in the Income Tax Act. Further, it has also been provided that the requirement of payment of STT at the time of transfer of such long term capital asset shall not apply if the transaction is undertaken on recognized stock exchange located in any International Financial Services Center (IFSC) and the consideration of such transfer is received or receivable in foreign currency. It has also been proposed that no benefit of cost inflation index in respect of cost of acquisition or cost of improvement as provided in first and second proviso to Section 40A will be granted in case of such transactions. (ii) The full value of consideration received or accruing as a result of the transfer of the capital asset, whichever is lower. In this way it is quite clear that if the fair market value of such shares is less than the full value of consideration, the same will be compared with the actual cost of acquisition and the higher of the two would be considered as cost of acquisition for the purpose of computing long term capital gain. In the reverse situation, if the fair market of such shares is more than the full value of consideration, only the full value of consideration will be compared with the actual cost of consideration and the higher of the two would be considered as cost of acquisition for the purposes of computing such long term capital gain. 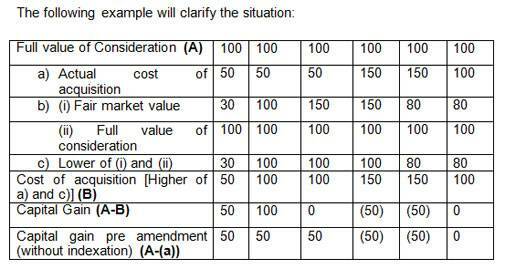 For the purposes of computation of such long term capital gain the definition of "fair market value" is proposed to be given under Explanation (b) to Sub-Section (8) of Section 112A. This provision defines the fair market value of a capital asset listed in any recognized stock exchange being the highest price of the asset quoted on such exchange as on the last day before or on 31st January, 2018, the latest on which the asset was traded in the exchange. For a non-listed asset, the net asset value of such asset as on 31st January, 2018 is considered to be the fair market value. Further, the definition of equity oriented fund has been defined to me a fund set up under a scheme of a mutual fund as per Section 10(23D) of the IT Act. In case where the funds invested in the units of another fund which is traded on a recognized stock exchange, a minimum amount of 90% of the total receipts of such funds are proposed to be invested in the units of such other funds and such other fund is required to invest a minimum of 90% of its total proceeds in the equity shares of domestic companies listed on recognized stock exchange. Further, in any other case a minimum of 65% of the total proceeds of such fund is proposed to be invested in the equity shares of domestic companies listed on recognized stock exchange. The capital gains arising as per these provisions are to be excluded from the gross total income for the purpose of claiming deduction under Chapter VI-A. Similarly, the rebate u/s 87A shall also be allowed from the income tax, net of such capital gains tax.